Meet Wendy, a 23 year old student from Pensacola College. Originally from Taiwan, Wendy ventured to the U.S. after receiving her degree in fine arts to pursuit her love for graphic design. On break from classes, Wendy traveled to Chicago to get a taste of city life, and to intern at C2 Creative. Wendy and I sat down at a local coffee shop to talk about her experience in the Windy City, her current design inspirations, and most importantly, to drink some much needed coffee. When did you start having an interest in graphic design? I started drawing when I was really young, and my mom noticed at an early age that I had a talent for it, so she signed me up for drawing classes. When it was time for college, I originally went to a university for fine arts. During that time, my university had a contest for students to enter logo designs for the art department. And I won! After that is when I realized I really wanted to go into design. What in design or advertising is your current inspiration? I get inspiration from window shopping, and looking through magazines. In advertising, I really like Coca-Cola and Pepsi. They have the best advertising. And Starbucks, I love their package design. What have you learned at your internship with C2? I’ve really learned to just focus, and to work on something without being distracted. At C2 they’re really good at listening to their clients problems, and figuring out how to solve them. I’ve learned to focus on the solution to the problem to. Do you have any other agency experience? Yes, I do. This is my fourth internship. I interned at Isobar, Atomic Graphic, and at Chung Din Real Estate Advertising Agency. How do you feel design differs between here and Taiwan? In America, they really focus on new ideas and they appreciate design. In Taiwan, they have an old way of thinking, and they use a lot of celebrity endorsements. Design is progressing, but very, very slowly. What’s your experience been like in the Windy City? I love Chicago. Everyone is so nice. I hope to find a job here when I graduate. I’d be happy to work anywhere, but I’ve really enjoyed working at a smaller agency like C2 Creative. I’ve learned so much while I’ve been here. What are you looking forward to the most about graduating? Just to work, save some money, and explore America. That wraps it up for now on the intern feed. Check in later for more exciting stories through the eyes of an intern. Naming a brand or a company is one of the greatest opportunities to differentiate your business in the market. It can also be one of the biggest challenges. With the explosion of Apps and other digital products, consumers are constantly encountering new names and brands. How are brands competing for attention? Here’s a look at some trends in brand naming from the last two years. Franken-names, or the combination of two seemingly unrelated words, are a great way to position your brand with a functional name. When using direct-naming, you’ll want to make sure you apply a strategic process to arrive at the right solution. A simple name may look easy to execute but rarely is. You’ll also need the marketing dollars behind the brand to secure URLs and navigate through the trademark process. Developing a completely original name can be very beneficial. Unique names are associated with forward thinking and creativity, giving your company an edge. Names that are built on phrases can be easy to remember since they’re already part of the consumer’s vocabulary. They may also have the additional benefit of generating organic traffic to your website if your name is aligned with search. Studies have shown that alliteration can act as a tool for better memory. Repeating similar sounds in your name sounds nice, and it helps you stand out against your competition. When it comes to the name game a strategic process should always be applied during development. No matter your business goals, you’ll want to ensure your name is strategically sound so your brand story resonates with customers, equity can be built quickly and you avoid any trademark conflicts before going to market. If you are interested in learning more about our naming portfolio and how we can help your next naming assignment email or call us. 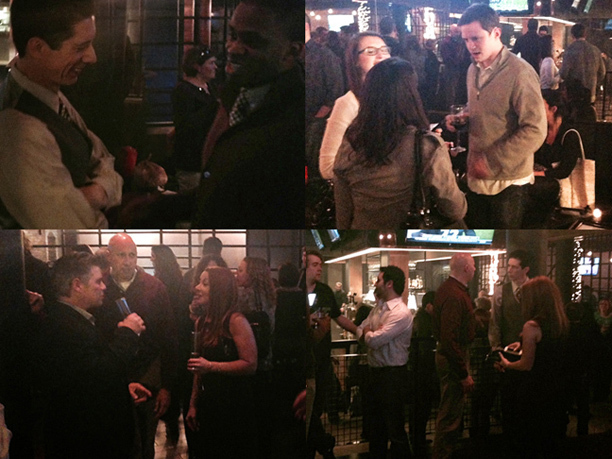 Thank you to everyone who came to our happy hour at The Grid last week. We had quite a turnout of clients, partners and friends. It was great seeing everyone and having a chance to catch up over a cocktail. We look forward to doing it again next year. Special thanks to Amelia for pulling it all together. It couldn’t of been a better evening. As the next generation of creatives is moving closer to their December graduation I highly recommend watching these three movies as soon as possible. Power isn’t the greatest movie you’ll ever see but it does illustrate the marketing and media machine that we’re all a part of in some way. It also has a little lesson about the best way to connect with the masses in an honest story. Jiro Dreams of Sushi has nothing and everything to do with creativity all at the same time. If I had to sum it up in one word it would be discipline. At first Art & Copy might seen antiquated for millennials because of focus on the past, but if it doesn’t inspire you to make more meaningful, more entertaining, or more socially uplifting creative ideas, few things will.